Excerpted from Chewy Gooey Crispy Crunchy Melt-In-Your-Mouth Cookies by Alice Medrich (Artisan Books). Copyright © 2010. Photographs by Deborah Jones. With all the amazing bakeries around, it's easy to find a spectacular chocolate chip cookie, a perfect cupcake, a to-die-for donut and a deliciously fudgy gluten-free vegan brownie. 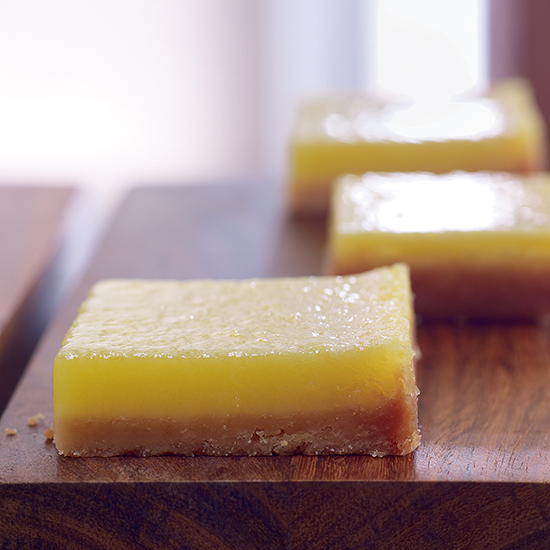 It's not so simple to find great lemon bars, which are often cloyingly sweet. That's why you have to make them yourself, and it's not hard. With all the amazing bakeries around, it's easy to find a spectacular chocolate chip cookie, a perfect cupcake, a to-die-for donut and a deliciously fudgy gluten-free vegan brownie. It's not so easy to find great lemon bars, which are often cloyingly sweet, or soggy, or sweaty, or, maybe worst of all, taste like wet dog. That's why you have to make them yourself, and it's not hard. I like my lemon bars simple and super tart; that's why I adore the below recipe, which come from the amazing San Francisco baker and chocolate master Alice Medrich. If you love to bake and haven't seen Flavor Flours, check it out—it just might change how you bake forever. Another recipe I love is the one for these dreamy lemon ripple cheesecake swirl bars from Camden, Maine-based cookbook author and "cheesecake specialist" Elinor Klivans, and I'm not alone—they've been a huge fan favorite at F&W ever since we published the recipe over 10 years ago. This recipe has been adapted from Chewy Gooey Crispy Crunchy Melt-In-Your-Mouth Cookies by Alice Medrich (Artisan Books, 2010). Alice says "an esteemed New England cooking magazine once pronounced my lemon bars too sour, though my cooking students and guests continue to declare them the best ever. Perhaps it’s a New England versus California thing. I mention this so you will know what you are getting into here: very special (and very tangy) citrus bars with a tender crunchy crust." 1. Preheat the oven to 350°. Line a heavy 8-inch square metal baking pan with foil. 2. Make the crust: In a medium bowl, combine the melted butter with the sugar, vanilla and salt. Add the flour and mix just until incorporated. Press the dough evenly over the bottom of the pan. Bake in the bottom third of the oven until the crust is well browned at the edges and golden brown in the center, about 25 minutes. 3. Meanwhile, make the topping: In a medium bowl, whisk the sugar and flour to mix. Whisk in the eggs until blended, then whisk in the lemon zest and juice. 4. Turn the oven down to 300°. Carefully slide the rack with the pan out and pour the filling onto the hot crust. Bake for 20 to 25 minutes longer, until the topping is puffed at the edge and no longer jiggles in the center. Transfer the pan to a rack and let cool completely. 5. Lift the foil liner and transfer the bars to a cutting board. If the surface is covered with a thin layer of moist foam (not unusual), you can blot it gently with a paper towel. Cut into bars and dust with powdered sugar just before serving if desired. The bars can be refrigerated in an airtight container in the refrigerator for 3 days.